Loving the story behind and scholarly aesthetic of these preserved pigeon feathers from BROOKLYNrehab. WING IT: We’re fond of our city’s feathered inhabitants – what would this place be without the pigeons? 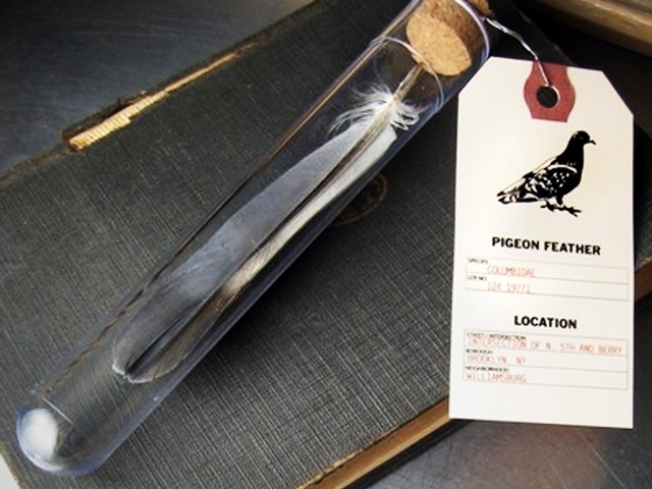 Williamsburg’s BROOKLYNrehab turns the birds’ iconic status into scholarly objets, placing found (and sterilized) feathers into corked test tubes and labeling each one-of-a-kind find with its location and date. Sweet, quirky, and unique, just like the city it represents. $14 from BROOKLYNrehab. DUOTONE: For us, proper pedicures start with Essie nail polish, pretty much guaranteed to stay on until our tootsies are dipped in acetone. The company teamed up with J.Crew on two exclusive colors: One of a Kind – a red that can only be described as “madcap” – and Eternal Optimist, a milky translucent pink. A.k.a. the only two colors you need. $8 each at a J.Crew near you. PORKY’S: Bringing wine to your hostess is always fine, but for extra points, pick up one of these French-inspired but Cali-made saucisson secs from Fabrique Délices. The porky slabs are cured for 30 days and come out dense, chewy, peppery – and just begging to be washed down with icy rosé. $21.99 at Murray’s Real Salami (Grand Central), 43rd Street and Lexington Avenue; 212-867-7202.